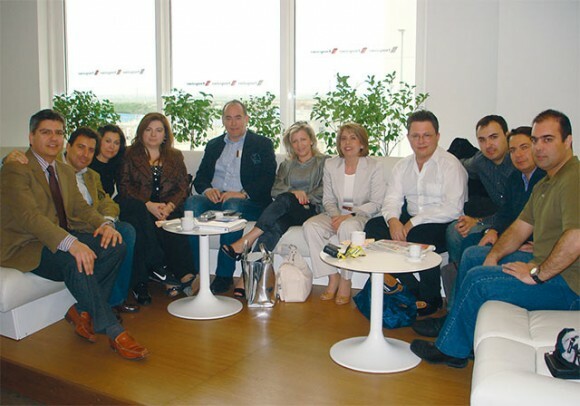 Sales manager for Continental Airlines in Greece, Dimitris Karagioules, with Navigator Travel & Tourist Services General Managing Director Andreas Stylianopoulos, Lia Seitanidou (Aktina Horizon), Stefania Gkova (Aktina Travel), Stavros Bouzanis (Dream Travel), Efi Economou (Efilial Travel), Vivian Benmayor (Memphis Travel), Tasos Avramopoulos (Atlantic Bulk Carriers), Dimitris Matheos (Aspida Travel), Makis Benetatos (Carlson WagonLit) and Stelios Ioannidis (Kyvernitis Travel) at the Executive Lounge of Athens International Airport just before the group’s departure. Continental Airlines recently organized a second familiarization trip for 10 travel agents in order to inform them on all aspects of the airline’s services and beyond. On the previous familiarization trip travel agents were toured around Newark Liberty International Airport, Continental’s hub in New York. On this familiarization trip, travel agents went through the transit procedure for an internal Continental flight to Fort Lauderdale, Florida, where (in cooperation with Navigator Travel & Tourist Services) they boarded a four-day cruise to Cozumel, Mexico. In this manner Continental Airlines showed the travel agents alternative and less costly answers to travelers’ increasing demands.